If you're planning a house or office relocation, packing all your belongings up can be something of a nightmare. 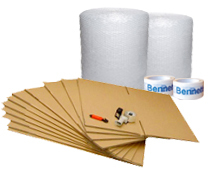 At Bennetts Removals, our aim is to make it as easy for you as possible, with our highly-practical and cost-effective packing service. We'll take care of packing your items securely, no matter how big or small, before safely loading them onto our trucks to deliver them to your new property in next to no time. If you're happy to pack your belongings yourself, we can supply high quality packaging materials that are perfectly suited for the job. From boxes and tape to bubble wrap and packing paper, we do it all. To order your packaging materials, simply click on the button below and complete the order form. We have now opened our shop selling packaging materials direct to the public. Everything you will need to pack your belongings safe and securely. Call in at Unit 8, Atlantic Trading Estate, Barry, CF62 7EB. happy to assist with your request instead. Every move is different, so it's important that we arrange to visit your home or office to discover your unique requirements. We can then work out which services you require and provide you with an accurate quotion for your particular move.